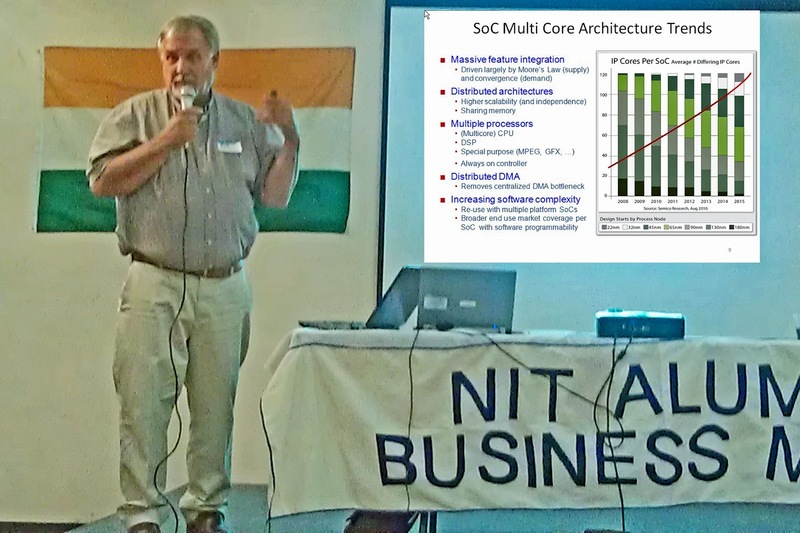 On August 15, the Silicon Valley Alumni Meetup Group for India's National Institutes of Technology (NIT) hosted presentations by Dr. Ajoy Bose, President and CEO of Electronic Design Automation (EDA) vendor Atrenta, and well-known EDA industry executive and investor - Jim Hogan. Dr. Bose provided a review of the concepts underlying System on Chip (SoC) Realization, for those non-EDA attendees who may have been unfamiliar with the ideas first proposed by Cadence Design Systems, in their EDA360 whitepaper. 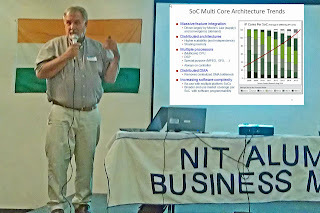 Taking a higher-level industry view of the opportunities and challenges in the SoC industry, Hogan followed Dr. Bose with "System on Chip - Why should we care?" With mobile device applications now the leading driver for semiconductor industry growth, Hogan centered his presentation on a financial comparison of Apple to chip companies Intel, Qualcomm and ARM Holdings. In his analysis, Apple serves as the best example of of a growing trend for value shifting to systems companies, which they will leverage by designing their own SoCs. Fabless chip companies and Integrated Device Manufacturers (IDMs) are under attack, he said, and other system companies will have to follow Apple's lead. Chip and systems companies are not the only industries chasing Apple's example, however, as their impact on the music business has demonstrated. Nevertheless, in Apple versus the rest of the mobile industry, which essentially means the Google Android ecosystem, the Cupertino company's advantage derives from their ability to leverage a whole product platform. Hogan showed teardown comparisons of the iPad and iPhone 4S mother boards, both featuring Apple's A5 series application processors. According to a X-ray analysis which Chipworks has performed, Apple is also using a 32nm version of the A5 in their Apple TV 3, moving down a process node from the A5x in the iPad 3. A 2nd core, inactive "dark silicon" that puzzled Chipworks in the Apple TV, will likely be turned on in the forthcoming next-generation iPhone. However, in their MacBook Pro, Apple proudly boasts of employing "The latest quad-core Intel Core i7 processors". The difficulty, for any company seeking to emulate Apple, is that their platform includes ingredients that go well beyond hardware and software. Apple's assets include intangibles, such as the brand value they have achieved from creating a cult-like "user experience", to their packaging of content and business model. Google struggles with the nuances of the whole-product concept, as their recent Nexus Q debacle demonstrates. An SoC alone does not a successful product make. Turning to opportunities for EDA companies, Hogan said that the space between Virtual Platforms for developing software, and Register-Transfer Level (RTL) hardware design, is increasingly interesting. He predicted that formal methods will likely be used for such solutions. Systems companies will increasingly need to differentiate through software, which presents a big opportunity for EDA companies that are adjacent to the space, he said.